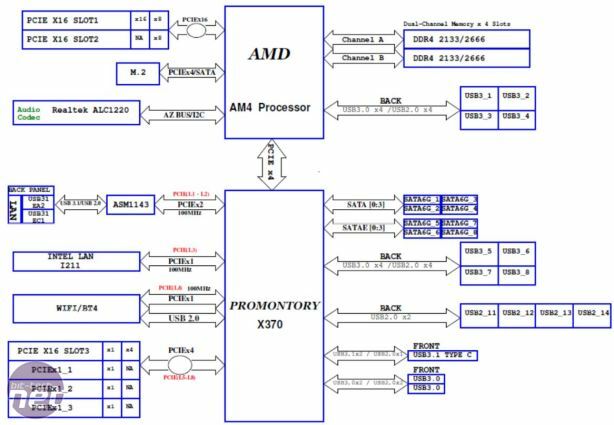 There are three distinct overclocking-capable chipsets and each is designed to fill a different segment. Today, you'll likely see motherboard reviews and CPU reviews that use the flagship X370 chipset, which is also the only one to support CrossFire and SLI. It also boards the most PCI-E 2.0 lanes and native SATA 6Gbps ports. 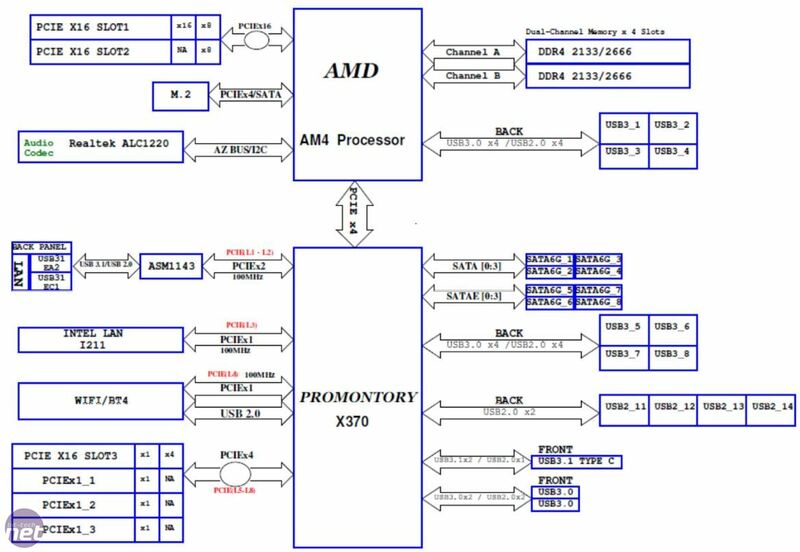 There are two 'Essential' segment chipsets too, both lacking overclocking support, with the standard essential range using the A320 chipset having fewer PCI-E 2.0 lanes and USB ports than B350 or X370. The second chipset in this category is A300, which partners with X300 and both are aimed at small form factor motherboards. They rely on the CPU to provide the essentials when it comes to port bandwidth and controllers, with the aim of reducing the load on the motherboard. Most likely mini-ITX in size, this makes sense as it will mean less complicated PCBs and less heat to deal with. For instance, the X300 chipset is overclocking capable, so small form factor fans can certainly rejoice, but it's also a cut-back version of the X370 chipset in terms of features and power. In AMD's own words, it allows for a greater clear surface area for other components and has been purpose built for mini-ITX. Sadly, we haven't seen any AM4 mini-ITX motherboards yet, so it's anyone's guess as to where they'll fit in. the latest tables also point to them lacking USB 3.1 Gen 2 support. We're not sure if it's a typo, but the X300 chipset is listed as having an option for two PCI-E slots each with eight lanes. Like we said, this is possibly a typo, especially because as far as we know, the X370 chipset is the only one to support multi-GPU setups. 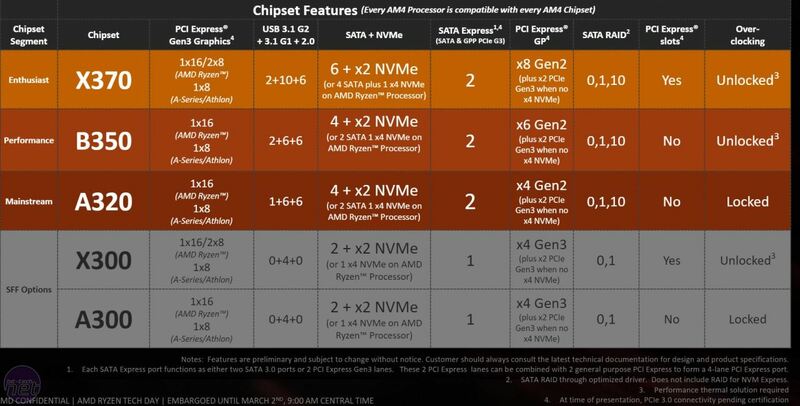 It's most likely just stating that the CPU is still providing either one 16x PCI-E slot or two 8x PCI-E slots - whether we'll see a dual-slot mini-ITX board is another matter. It's worth noting, however, that reports we've heard indicate you need boards with decent cooling and power circuitry to achieve reasonable overclocks, so while B350 may be overclocking-capable, just how capable remains to be seen. The same possibly goes for X300.